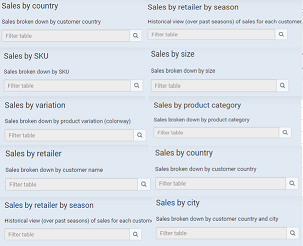 Product & Season - Stitchex Product & Season reports are reports that help you see Sales by SKU, variation, product, retailer, retailer by season, size, product category, country or season. Financial - Stitchex also offers Financial reporting which includes per season revenue breakdown reports, per season invoiced breakdowns and outstanding balance reports. Sales Agent - Sales Agent reports can provide projected sales by agent as well as invoices created by agents. Please note that if you confirmed an order "today" (e.g. April 14) and want to see it in your report, you will need to include the confirmed start date (e.g. April 14) today but the end confirmed date for tomorrow (April 15). 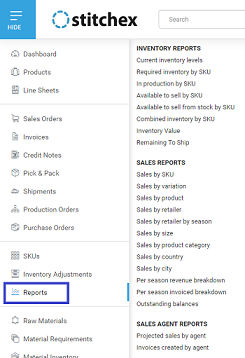 See Sales Order Current State Reporting for additional real-time data on your Sales Orders. Also see Sample Sales Order Reporting.